The challenge at Flourishes Timeless Tuesday this week is Bingo. 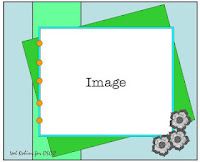 Heather asked us to include 3 items from the graphic either across or diagonal on your project. 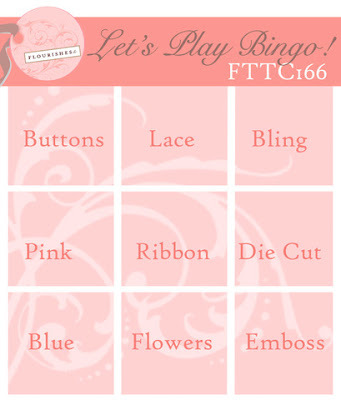 I chose the center row to use pink, ribbon and die cut. 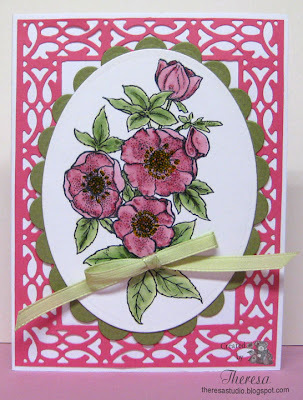 I used the image from Flourishes "Lenten Rose" that I colored in Pink Copics . Used a die cut frame and die cut oval mats. Finished with a ribbon bow. Loving this Cheery Lynn Die. You may see me use it often.. The Speedy Fox and Friends Challenge for Week 105 was suggested by Barbara and is "Blues". This card is about blue as one can be. 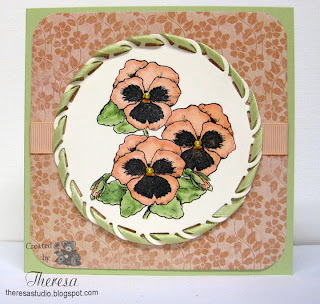 I used masking and sponging to get this effect with stamps of pansies and butterflies. Added silver edging to the image and attached to a card base of navy blue. The photo has a bit of glare but at least you can see it is on glossy paper and see the shine on the wings and center of pansies from a Clearstar pen. This was inspired by some techniques that I saw at the Akron Stamping Convention last Saturday. 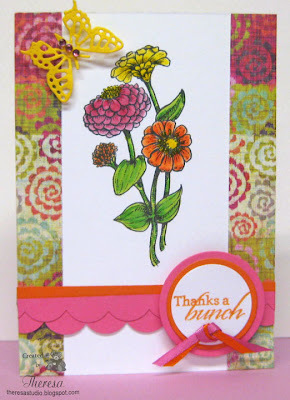 the card in Cheery Lynn's Challenge which is to make a project for Mom and ends tonight. 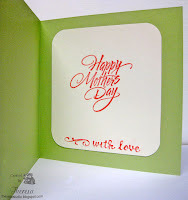 The Pixie Cottage: Challenge #118 has theme "For Mom"
Stamp TV Mix It Up Monday: STV12MON14 Make a Happy Mother's Day card...I usually use GKD stamp for STV challenges but going to break my own rule. Stamp: Hero Arts "Happy Mother's Day"
I am off to play some more. Welcome! This is another fun card that I made using Die Cuts from Lili of the Valley. 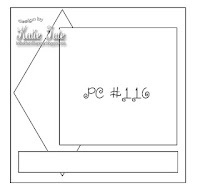 I followed the sketch (but gave it a turn) from Lili's Little Fairies challenge...this is my first time to enter their challenges ...a requirement is that you must use a Lili of the Valley stamp or die cut topper on your project. 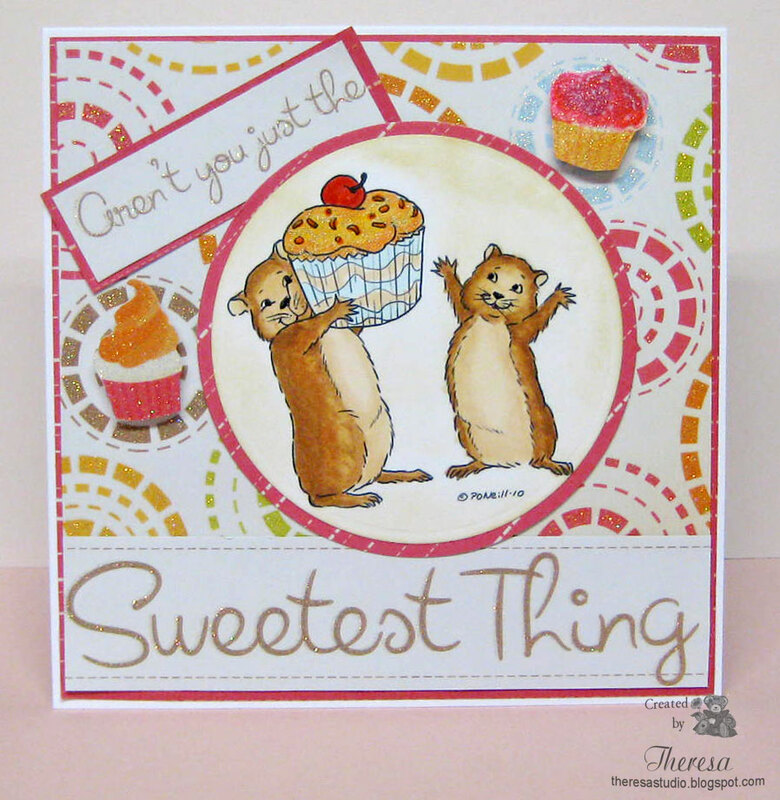 The Teddy Bear Picnic image is from The Teddy Bear Fun die cuts set. I added a lady bug metal button, a metal daisy charm, and some handmade daisies to finish. 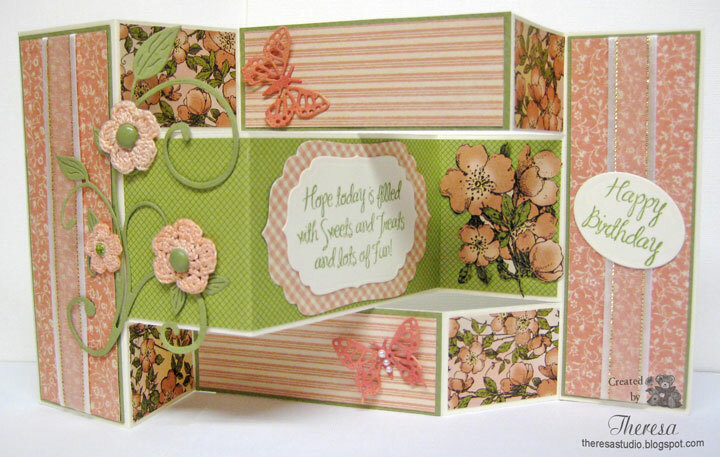 Image: Lili of the Valley "Teddy Bear Fun"
I made this card with Vintage, Shabby Chic, Mother's Day, butterflies, fancy folds and other ideas in mind . I will be entering it into several challenges. 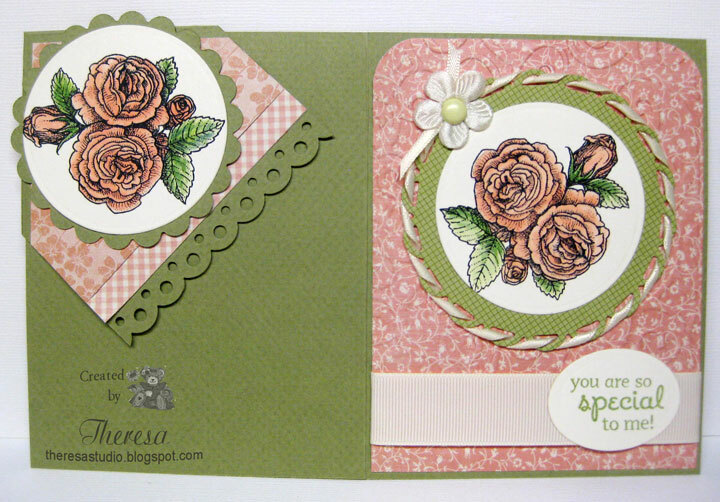 The image on the front is from Magic Moonlight and the inside Rose Graphic is from Graphics Fairy. I used the Joy Fold design for my card which I have shown with the card closed with a ribbon and also opened to show the inside. Sugar Creek Hollow: Fancy Folds -Create cards with more than one fold that are vintage, shabby chic or primitive. Use joy fold...think this one is Shabby Chic...not sure if this vintage or shabby chic but could be both??? Our Creative Corner: Week's challenge is butterflies...I have one lovely butterfly on the front graphic and more on the inside. 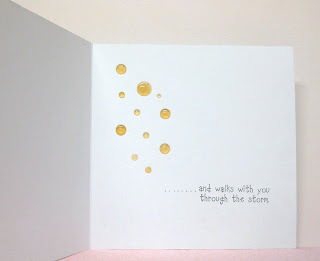 CRAFTS AND ME Challenge: Theme is embossing. 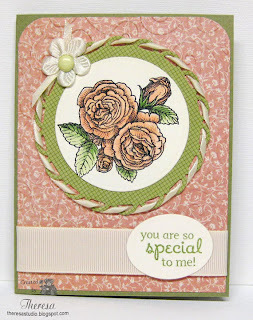 Repeat Impressions DCC425: This challenge at The House That Stamps Built is to create a card for a Woman you love....this is for my Mother. Graphics from Magic Moonlight "Heart with Rose" and Graphics Fairy "Old Rose"
Hope you find some joy in a card today. 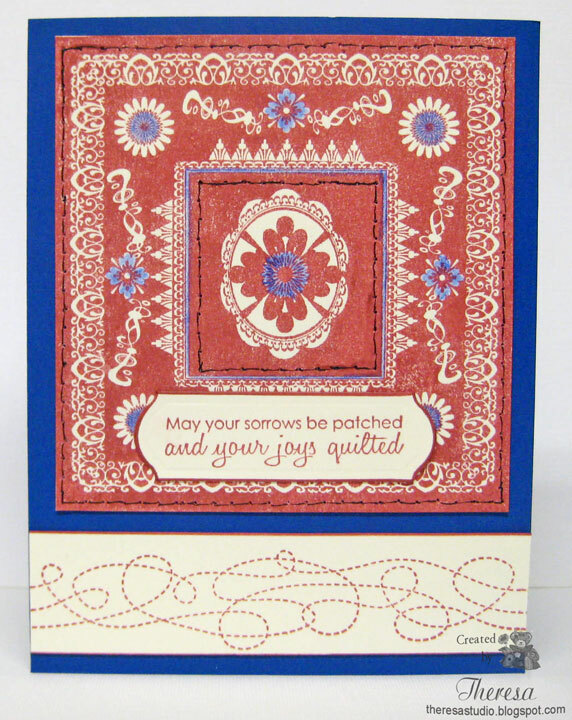 Quilting Joys for a Cowboy? 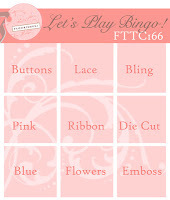 The challenge at Speedy Fox and Friends Week 104 was suggested by Linda....she wants us to use stitching/real or faux. I decided to use faux stitching by piercing holes and drawing in lines for the stitches. 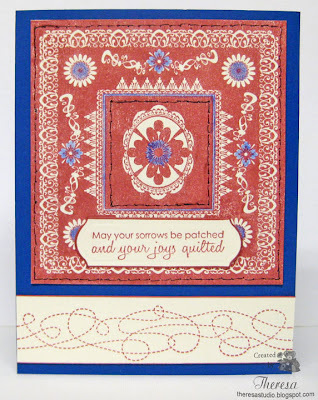 I wanted the card to look "homespun" so I did stitches freehand and they do look homemade, but maybe too much so. I used a bandanna stamp from Mark's Finest Papers "A Cowboy Thing" showing it as a quilt design...stamped in Memento Rhubarb Stalk Ink on ivory CS. Colored in some of the design with blue pencil. Added a border of stitches stamped with GKD "Nana's Needlework" and also used a sentiment from this stamp set keeping withe quilt theme. Card base of SU Brilliant Blue shows off the images. 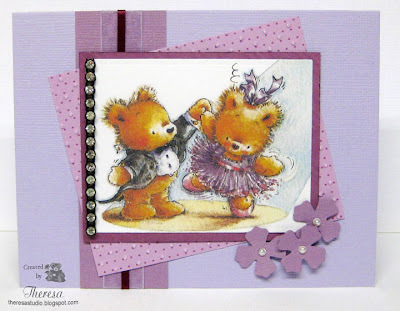 This card makes me want to sing...."You make me feel like dancing....dancin, dancing...". 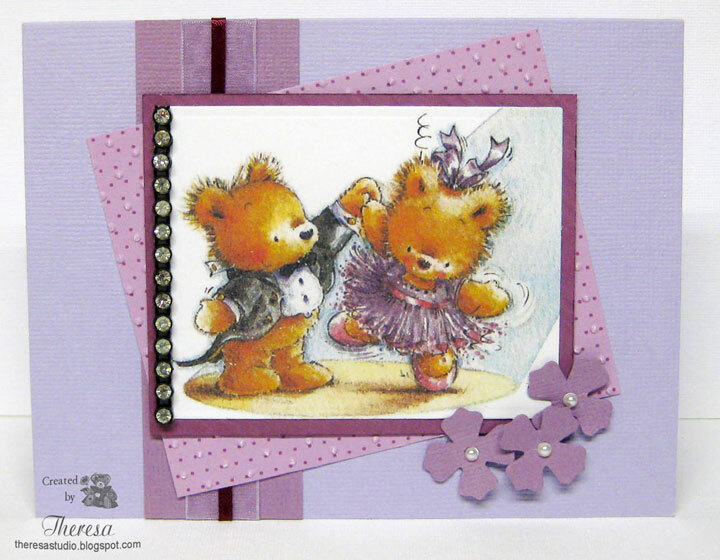 Love these little bears dancing from LOTV Teddy Bear Fun Die Cut Designs. 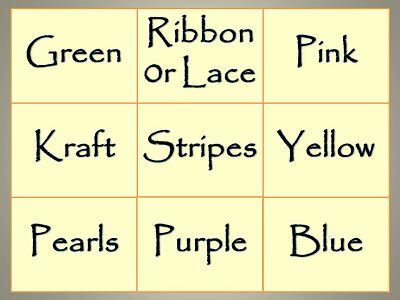 Simple to use since they are already colored. 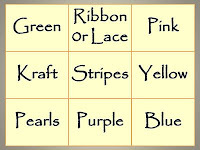 I picked up colors from her dress to make a monochromatic card in lavendars. 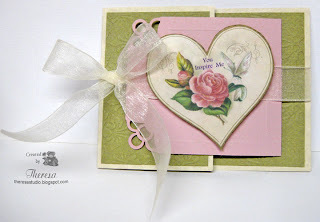 I used the sketch from One Stop Craft Challenge. Added some rhinestones reclaimed from trim on an old dress and some pearls on the punched out flowers. 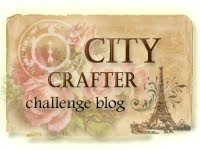 Secret Crafters Saturday Challenge: Theme is to be inspired by a Film Title. Inspired by "You Make Me Feel Like Dancing"
Stamp, Scrap, & Doodle Saturday: Recycle...Used rhinestones on black strip from an old dress. Papercraft Star: Polka Dots...pattern paper has polka dots and is embossed with dots. Tuesday Throwdown: Challenge is "use some sparkle." Used sparkling "Diamonds". Paperplay Challenge: Theme is Monochrome and ribbon. LOTV Bear Image from Die Cut "Teddy Bear Fun"
As soon as I saw this photo on the left at Lily Pad, I knew I had to pull out a very old favorite stamp that I have not used in a long while. And I have never colored this image with Copics so I gave that a try. I was very pleased with how beautiful the colors are and I think it turned out very well. 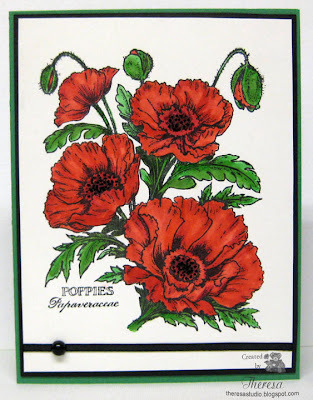 The stamp that I used is PSX "Poppies Botanical". Remember all those beautiful botanical stamps from PSX? 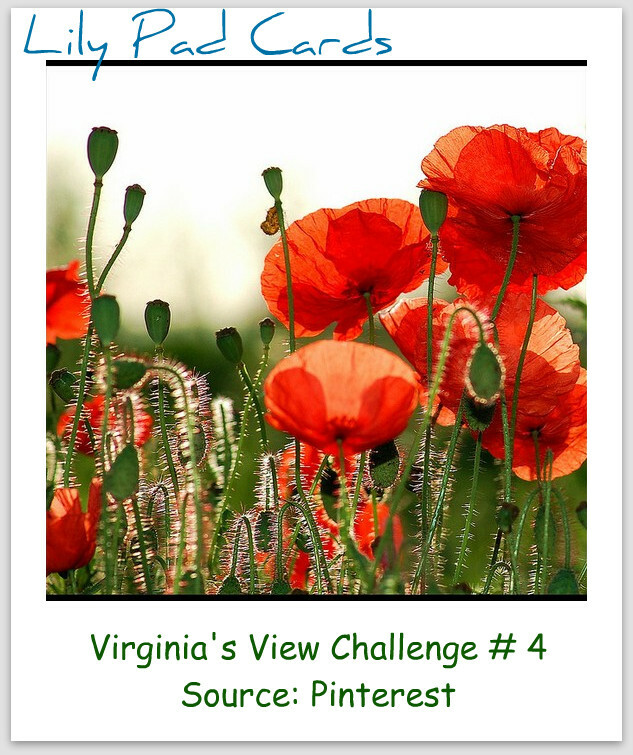 I have several in my collection.The photo is from April’s Virginia’s View Challenge with a prize of your choice of a FlexMarker set from Letraset. We are to make a new card using the photo on the left as a source of inspiration. 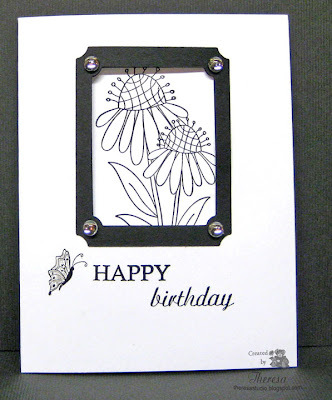 Have you thought of using any old favorite stamp in a new way? I enjoy playing with this Great Blue Heron stamp from Repeat Impressions....fun to color with different mediums and color variations. This time I used a combinations of markers, pencils, and copics. I followed the challenge sketch found at The House That Stamps Built blog adding some dragon flies to the design. Don't you always see dragonflies near water? 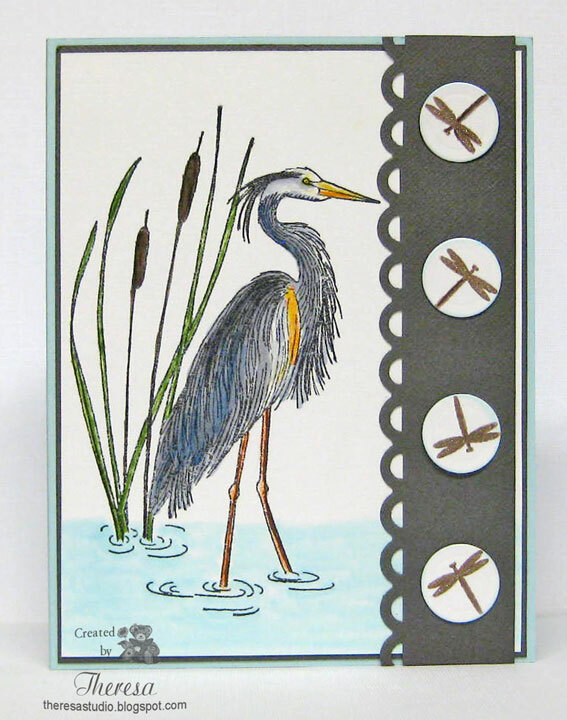 Stamps: Repeat Impressions "Great Blue Heron" and Flourishes Dragonfly from "Summer Blossoms"
Theresa Momber is the sponsor of Cas-ual Fridays this week so I decided to use some of her stamps in my entry for their sketch challenge. My card is very clean and simple....When I showed this to my DH, he said that he was used to seeing much more on my cards. 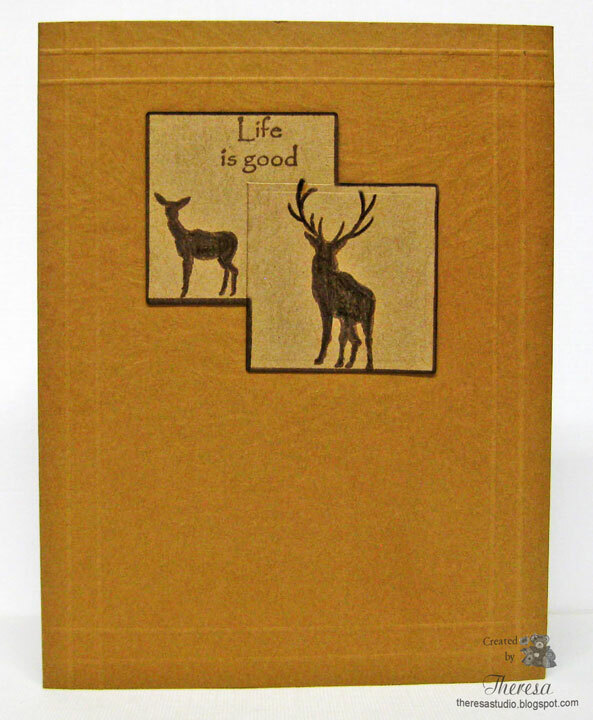 Not much here, dear, but some squares, deer, sentiment and score lines for texture. Hello! 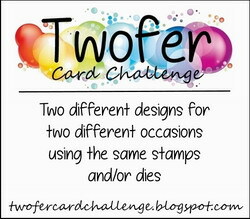 This card was made for the challenge at Friends of Speedy TV . 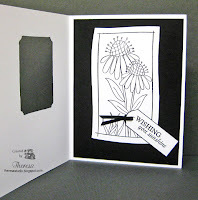 They are challenging us to make a card showing off flowers....anything we want to do to put flowers on a card. 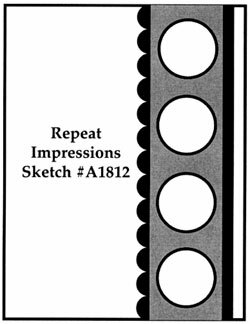 For inspiration we are playing for a stamp set from Mark's Finest Papers, a Heinrich Co .
All Sorts Challenge: Use sketch shown below. 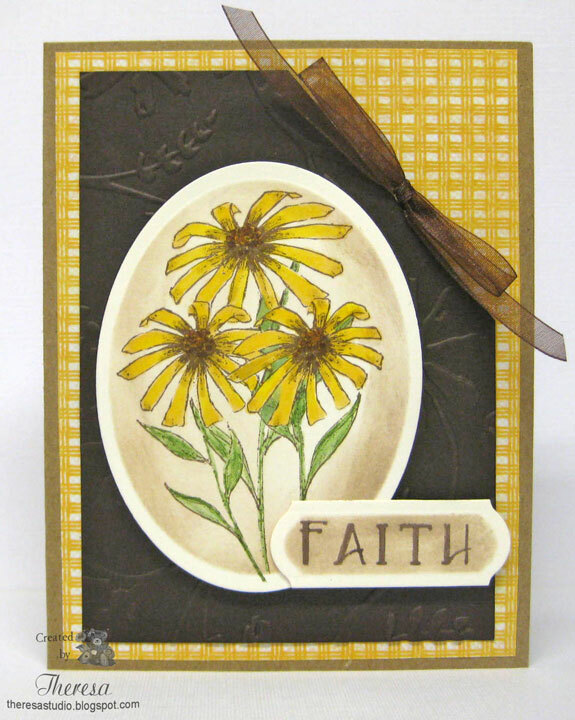 Stamps: Mark's Finest Papers, a Heinrich Co. -Black Eyed Susan Stamp and sentiment from "Pine Boughs"
When the weather is cold and gloomy outside, the best thing to do is stay inside and make a bright card....and this one is a bit brighter than I usually make. I hope it might brighten someone's day. I have used one of my favorite Flourishes stamps "Zinnias" but it's hard to say which is my favorite as I have so many faves. I colored the stamp with bright Copics after stamping on white cardstock with black ink. Added some side panels of pattern paper, punched strips along the bottom edge, and stamped the sentiment on layered circles with a touch of ribbons. Finished with a die cut butterfly with bright pink bling. Lot of bright pink, orange, yellow, and green used on this project. 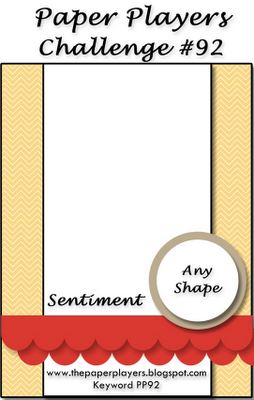 Timeless Tuesday #165: Show your love of Flourishes stamps by using your favorite Flourishes stamp set! 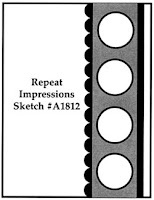 Paper Players: Challenge #92 is a sketch shown below. 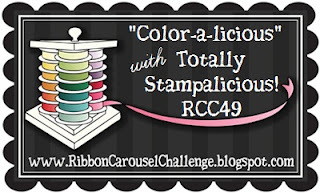 Ribbon Carousel Challenge: Get colorful...use bright colors. 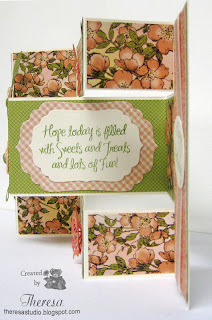 Crafty Friends Challenge: Use 2 dies. Welcome to my studio. The weather in Ohio seems to be leaving spring behind and bringing winter back. More snow is expected this week...Mother Nature, please check your calendar. 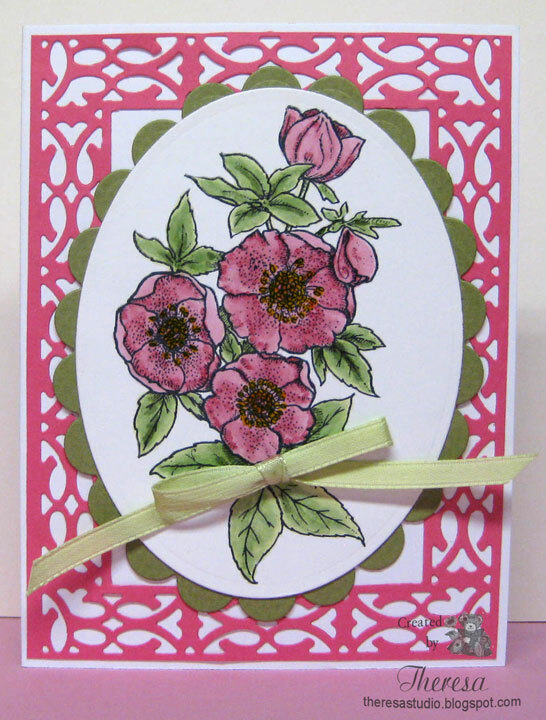 I am still in the spring mode and that is what my card is about....spring colors. 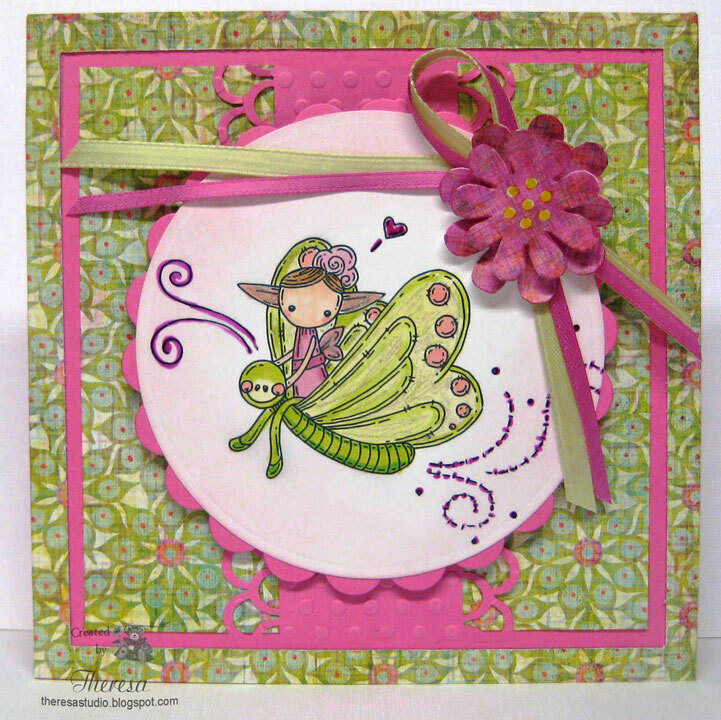 For this card, I used Meljen's "Flutterby Fairy" image and a color theme of Pink and Green. Followed a sketch from Sweet Sketch Wednesday but used circle instead of oval to better fit the image and shifted the panel from the side to the center. I decided to wait and add a sentiment when I use the card. 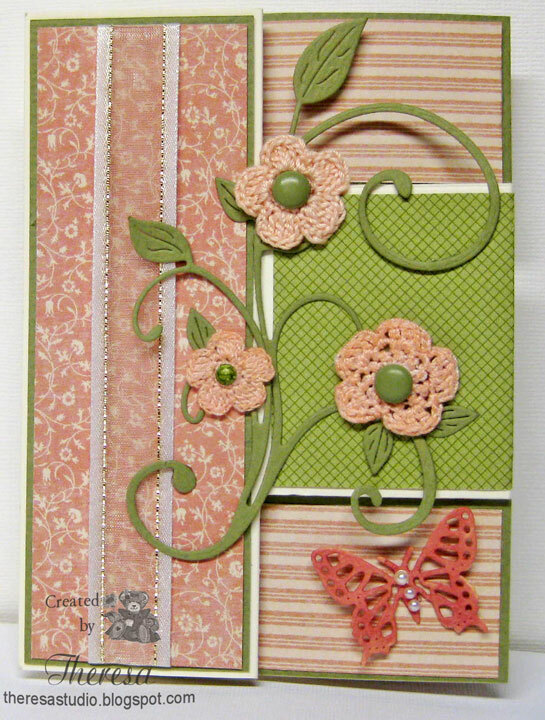 Meljens Design: Challenge 106-Theme is spring. 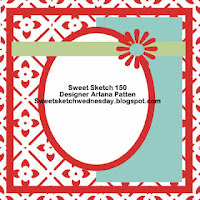 Sweet Sketch Wednesday: Sketch 160. See below. Modified a bit to fit my image...hope it still meets challenge. 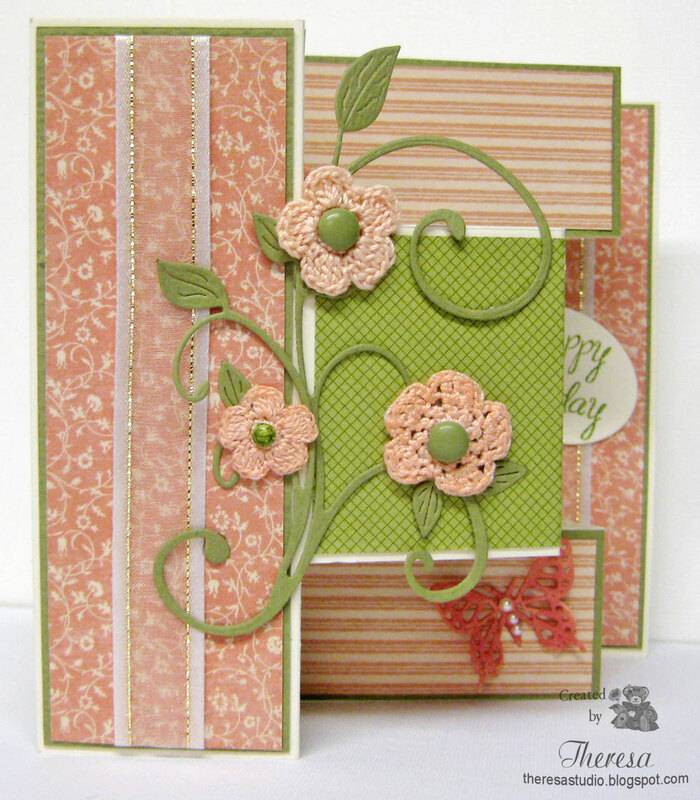 BasicGrey Challenges: Spring Colors...used Sweet Threads Pattern Paper and Page Kit. Crafty Friends Challenge: Use 2 die cuts- used circle and scallop circle. 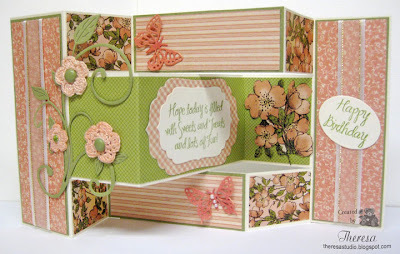 Paper Pretties: Monday challenge is Pink and Green. Fussy and Fancy: Challenge is punches and dies. 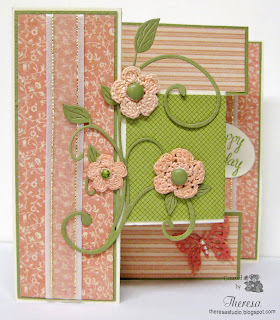 Stamptacular Sunday Challenge: Loaded with Layers. The Speedy Fox and Friends Challenge Week 103 is Rainbows. This was a bit of a stretch for me but I decided to make my own Rainbow design using Copics Makers. 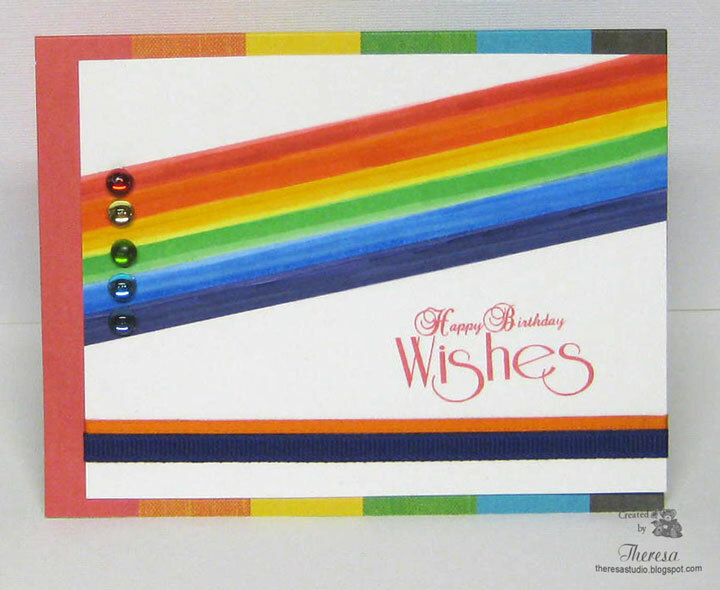 I colored the rainbow in stripes across the CS at a diagonal and added some ribbon stripes across the bottom and added colored sprinkles on the rainbow. Finished with a birthday sentiment. Found a Striped Paper in my stash that picked up the rainbow colors that I used as the card base. This card makes me want to sing "Round and Round I Go" as in "Old Black Magic". Maybe it's all the circles??? At Phindy's the Friday challenge is to make a food or drink related project. I have used her cute image "It's All Yours" that I colored with Copics B0000, B000, E0000, E30 ,E33 ,E35, YR 02, YR20, YR21, and R24 after printing on white CS. I used papers and cutouts from We R Memory Keepers Pad that had some glitter and sparkle. Finished highlights with Glaze Pens and Clearstar Pen. 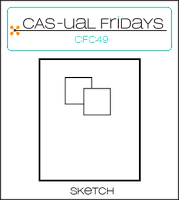 Phindy's Friday Challenge: Make a food or drink related project. Serving up a cupcake. Hello! If you have been looking for me, I have been outside working in the gardens this week. That has left little time for card making. 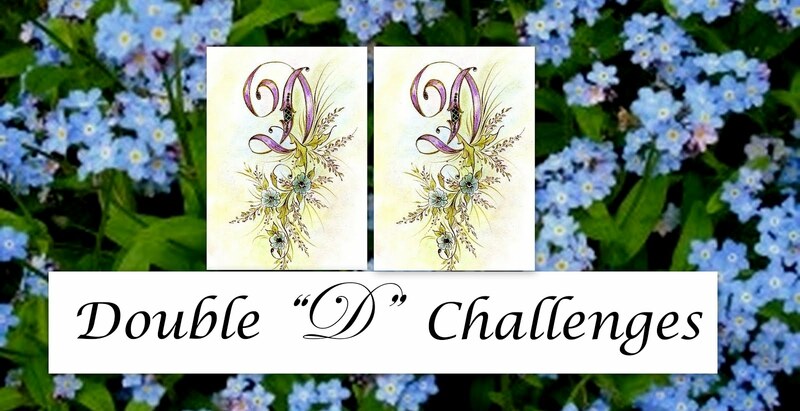 But before I get my hands in the dirt today, I made a quick card for some challenges some of which close very soon. I made this a window card with a frame using Spellbinders dies. I stamped sentiments on the front and a flower on the inside with a tag using only black ink. Finished with some sprinkles on the corners of the frame. 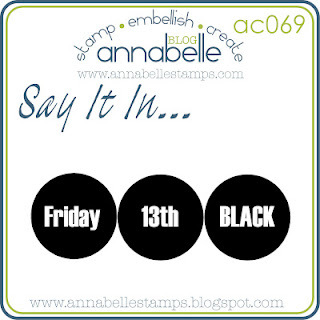 Annabelle Stamp Blog: Say it in Friday 13th Black. See Below. 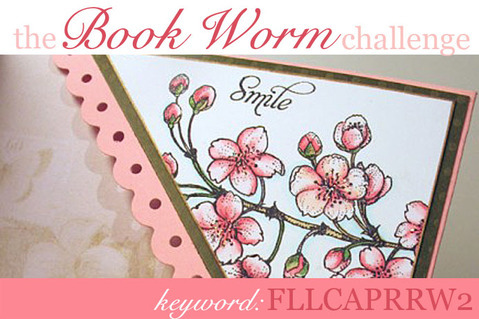 Sentimental Sundays: Challenge is Frame It! 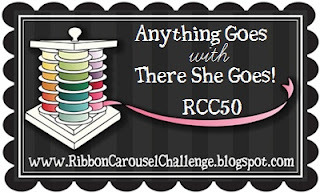 Stamptacular Sunday: Freebie week...anything goes. A Blog Named Hero: Challenge 2 is a card with a view. Yesterday was a day of April Showers and I was inspired to make this card for several challenges since it was not nice enough to play outside. This was one of those cards that surprised me by turning out much better than I anticipated. It was a joy to make because this stamp always reminds me of my sister. I paper pieced some of the design using pattern, solid, and glitter paper. Did you know it's hard to stamp on glitter? I had to draw in some of the lines with a fine black pen after cutting out the pieces. I used a sketch from The Pixie Cottage challenge and used cut out clouds and flower border from the paper pad that I used. Stamped the sentiment and cut out the cloud shape freehand and added a glitter edge. Still trying to use some of my old stash, I remembered that I had the raindrops that I used outside and inside my card. 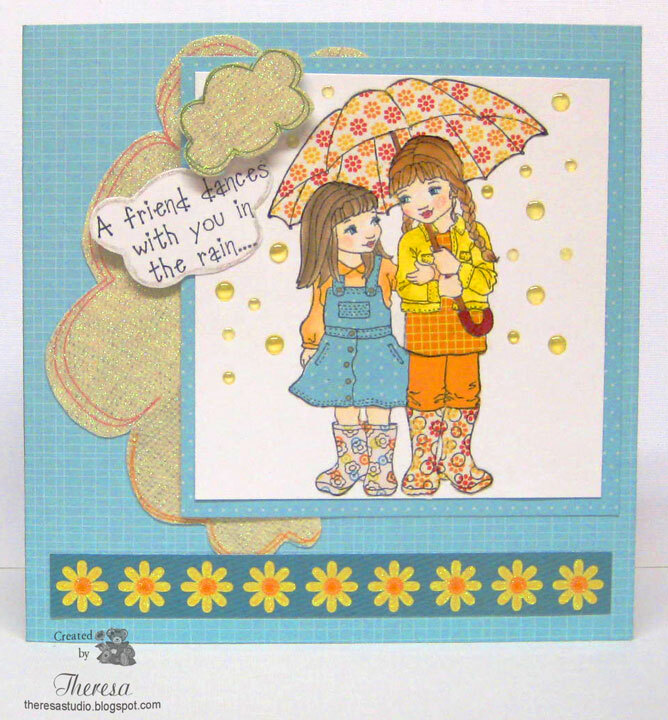 Also I used some never inked stamps that were the perfect finish: "A friend dances with you in the rain....and walks with you through the storm." 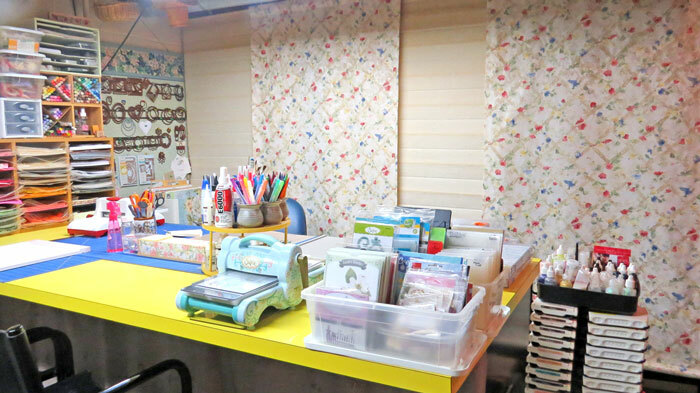 The Pixie Cottage: Sketch and theme of Paper Piecing . See sketch above. Oldie but A Goodie: Theme is April Showers. Papers and stamps are over 6 months old. Party Time Tuesday: Use water ...raining on my card! Papertake Weekly Challenge: Theme is April Showers or Water Everywhere. Simon Says: April Showers bring May Flowers. Papercraft Star: Challenge is to include an Umbrella. DYSU Challenge: Use glitter or bling. Used papers with glitter and also Clearstar pen for glitter. 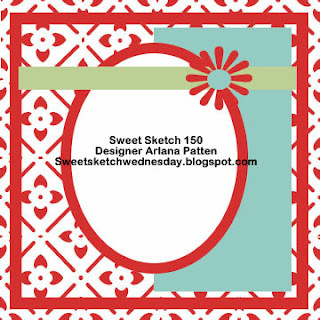 Sweet Stamping: Theme is Girly but no pink. No pink used in the making of this card. What's more girly than 2 sisters together? 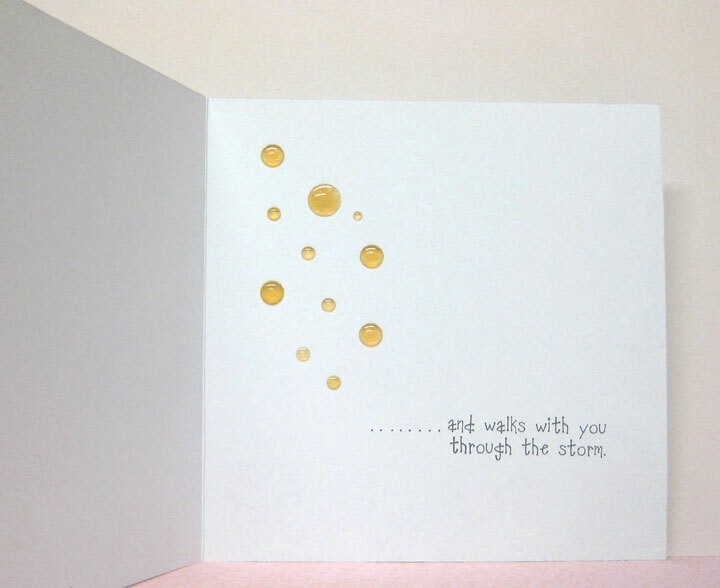 Stamp: Wags n Whiskers "Love You Sis" and Creative Vision sentiments from "What's Shakin'"
Looks like more April showers today. 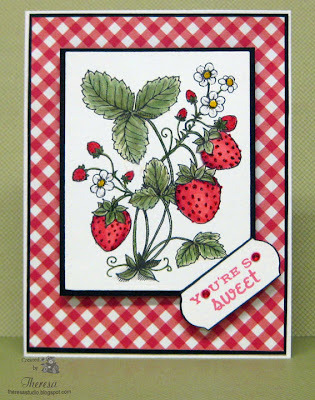 I have had the Flourishes "Strawberries" stamp set but have not used until now. When I saw Mona's challenge to create a card/tag focusing on a Fruit theme, I knew just what I was going to do. I stamped the Strawberries with Memento Tuxedo Black Ink and colored with Copics R22, R24, R27, G20,G21, and G99 and used Sakura Red, Clear, and Yellow Glaze pens on the image. The shiny glaze really looks good on the blossoms...hope you can see. Now I want to have all the fruit stamps from Flourishes. One more post today and I am done. I just had to get this entry in for Sugar Creek Hollow's Challenge to create a vintage card featuring flowers. 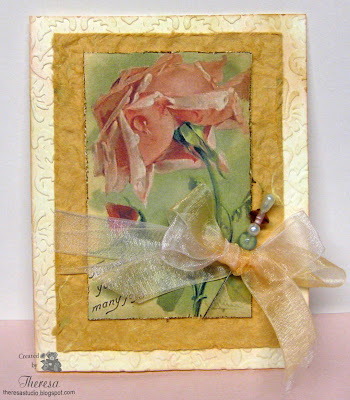 I love making floral cards and I found the perfect image to use at Magic Moonlight Studio Free Images. I simply printed the image, trimmed and distressed the edges with a distressing tool and distress inks. I used Ivory CS for the base but I sponged it with distress inks and embossed it to give a vintage look. Added a mat of handmade paper that I purchased a long time ago and also distressed the edges. To finish the card I wrapped 2 organza ribbons around the mat with image and tied a bow. Finished with a hat pin to which I added beads and pearls. 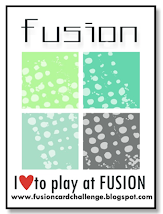 The great things about these printed images are that they are inspiration for colors and designs and so quick to use. Love this card...hope you do too. Another noon time challenge during Flourishes April release is to create something for the book lover in your life. Again, the winner will receive all the April Releases. 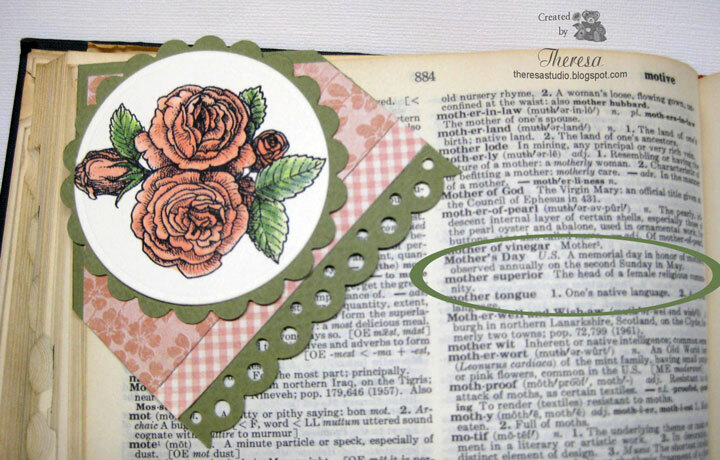 I decided to make a corner bookmark to go with the Mother's Day card that I made for another challenge. (See bottom picture) That was easy enough to do because I had all the necessary tools still on my work area. My corner bookmark shown below. This shows the bookmark on the corner of my Mother's Day Card. Good luck to all who are in the challenges at Flourishes. 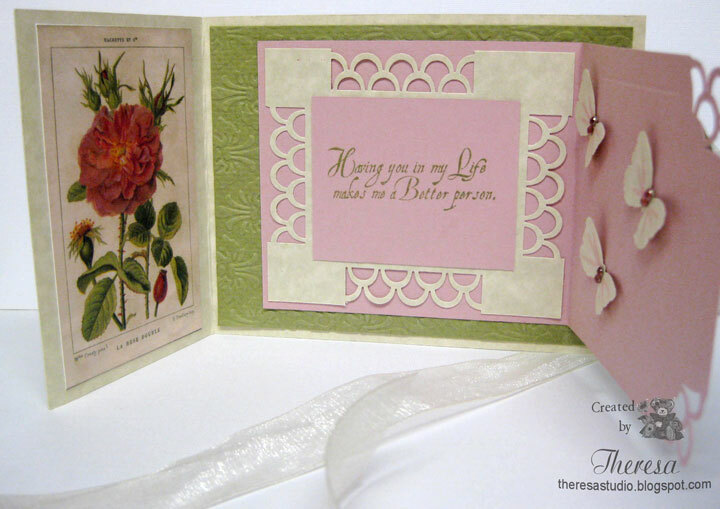 For Flourishes April Release week, create a card for a mom in your life and get a chance to win the entire release. The new release is full of some wonderful stamps that I love. To me Mother's Day means Roses and I have used the rose stamp from " A Year in Flowers-Set 2" one of my very favorites. The Roses are stamped on Ivory CS and colored with Copics. I matted the image on a circle of green cut with Lacey Circle Die and threaded ribbon through the edge and added a silk flower. The sentiment is from Flourishes "Strawberries". I finished the inside with a personal message to my Mother. My colors were chosen from the Pattern Paper background. 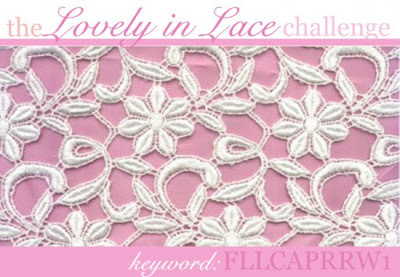 The first Noon Time challenge for Flourishes April release is the “Lovely in Lace” challenge. 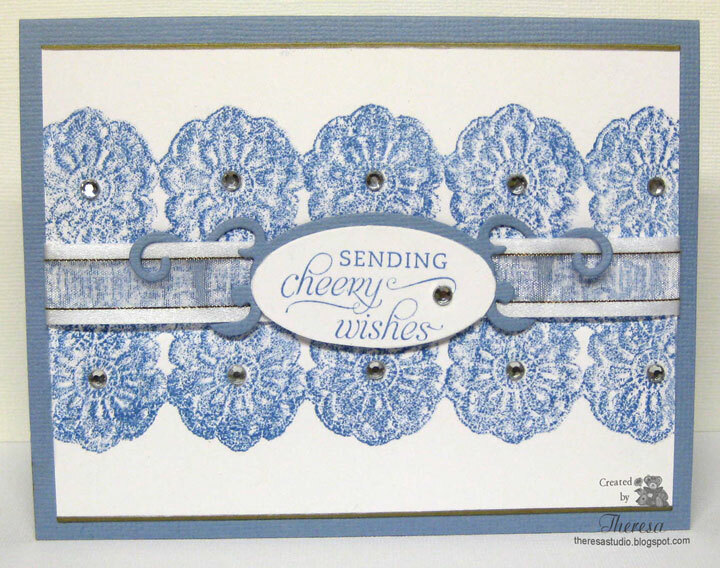 We are to use some type of lace on our cards - a lace trim, a lace background or even a lacy styled die cut. I knew I had to use Flourishes "Lace Edges" stamp set for my entry. 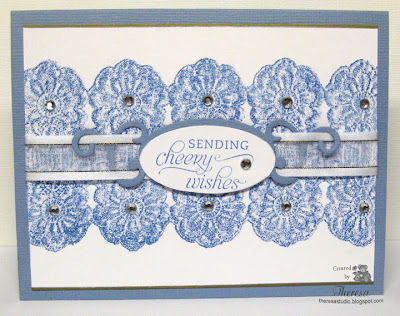 I stamped the lace border on Flourishes White CS with SU Brocade Blue Ink, edged the top and bottom with Pilot Gold Marker, added some ribbon thread with a Spellbinder Fancy Tag and a sentiment from "Spring Has Sprung". 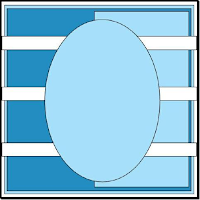 Adhered this to the card base of Bazzill Textured Blue CS. Finished with some rhinestone bling. And I have my entry! 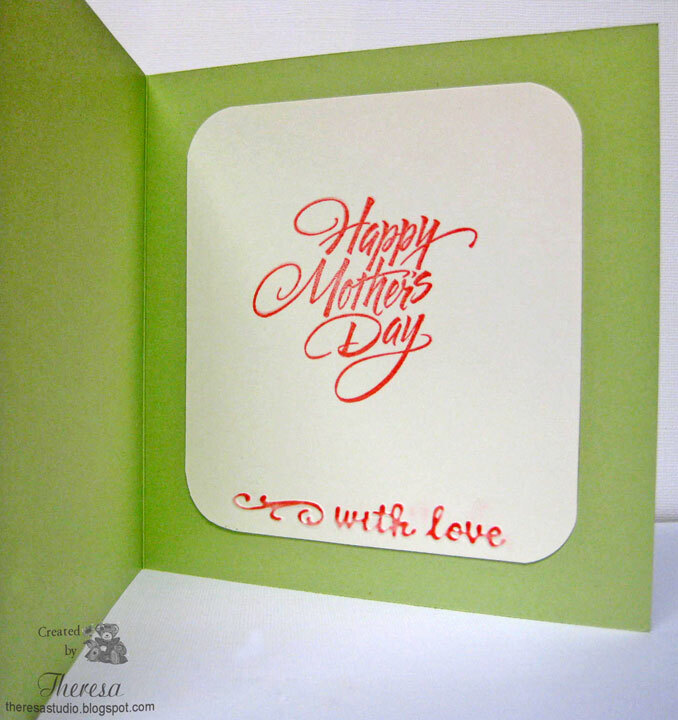 The challenge At Speedy Fox and Friends is to make a Mother's Day Card. I used some of the papers that I had on my counter to make this using Mark's Finest Papers Pansies Stamp. This was a simple card but I think my Mother will like it. I used Happy Mother's Day sentiment inside. Spring may be in the air but it is cold here and frost is in the air. I am ready for some warmer temps and spring flowers brought on by April Showers such as in the digital image that I used....he is one of my faves and you see him often in my cards. Sassy Cheryl's Challenge: Anything goes. Crafty Ribbons Challenge: Things with Wings and ribbon...That'd be the bee! PaperPlay Challenge: Things with Wings...the Bee! The challenges at Joan's Gardens have been relatively easy the last couple of weeks but this week she raised the bar a bit requiring us to work a bit more. 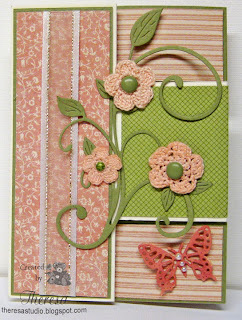 Her challenge #13 was to make a tri-shutter card, use more than one design paper, use something dimensional and use ribbon or lace. 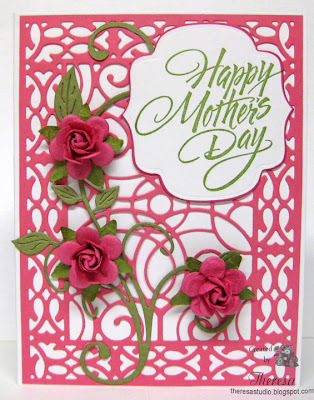 I have made this kind of card before but this was a bit more labor intensive....I kept adding more layers and had used 5 Pattern Papers and 2 solid CS's when I was done. I changed the card base 3 times before I decided which one to use. I love this Graphics DP and have been hoarding it but decided this was the perfect card and time to use it. I am letting the pictures and supplies list tell the story of this card rather than going through all the details. Joan's Garden: Details listed above. 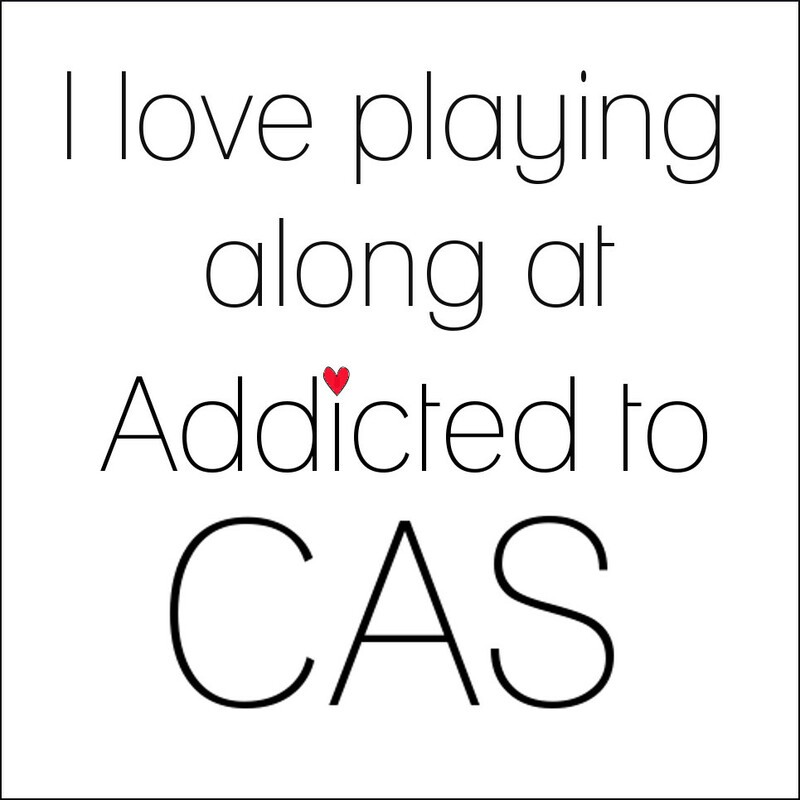 I covered them all. Cheery Lynn: Challenge is think spring. 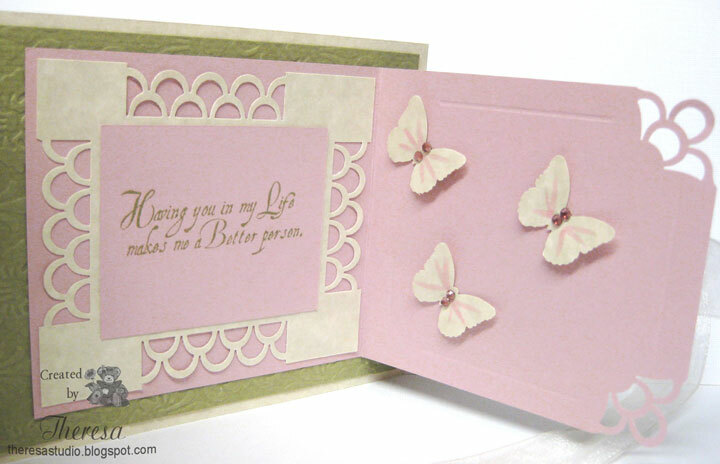 I think the butterflies and floral paper sing Spring. Cupcake Craft Challenges: Spring is in the Air theme. 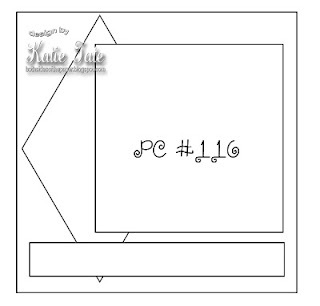 Paper Pretties Wednesday Challenge: Use 2 or more different designer papers. 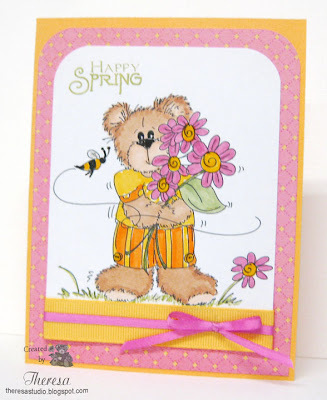 Crafty Sentiments: Spring Creations using pastel colors. CRAFTS AND ME: Use 3D embellishments. 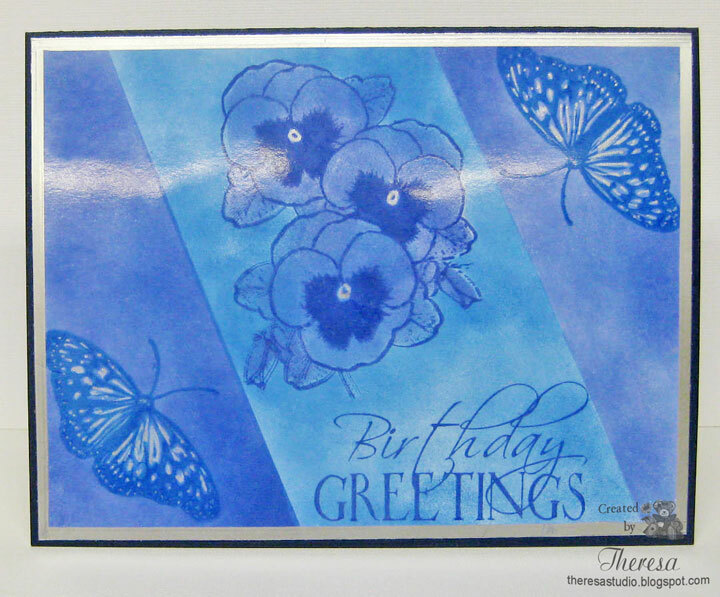 Flutter by Wednesday: Birthday Card with butterfly. Simon Says: April Showers Bring May Flowers...lot of spring flowers in my card. Stamps: Creative Vision "Make a Wish"
Thanks for dropping by...always enjoy hearing from you.